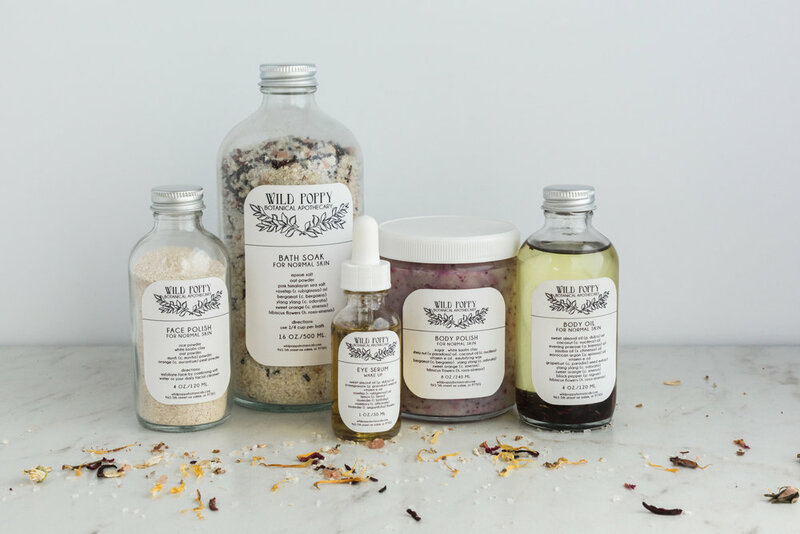 heiter had the chance to chat to Kira Doyle, owner and creative director at Salem, Oregon based natural skincare brand Wild Poppy Botanical Apothecary. When was Wild Poppy founded and what was the inspiration for it? Wild Poppy was founded at the beginning of the year actually, 2016. So we are still in our infancy. I have never been one to sit still for too long, though. I always need to be working with my hands and trying something new. Having a creative outlet is a must in my life. I also have two small children, 3 and 1. Having them has changed the way I look at the world, and not always for the best. I began to pay close attention to not only what I was putting in their mouths, but what I was putting on their skin, and using on my own. I was horrified to learn about some of the ingredients that are being absorbed into our bodies. This collision, my need for a creative outlet and a desire to create a product for truly healthy skin, caused the birth of Wild Poppy Botanical Apothecary. Why are your products different to other skincare products and what are their benefits? Every ingredient that we include in our products is there for a specific therapeutic reason. We do not use fillers of any kind, meaning that almost every ingredient in our products is an “active” ingredient. This results in pure, highly concentrated, and effective formulas that are a rarity in the skincare and cosmetics world today. All of our formulas are original, created and tested by us, on real people — never on animals and always from scratch. All of our products have an emphasis on natural, organic, high quality, vegan and gluten-free. The result is truly healthy and happy skin. What are the main ingredients and where are they sourced? Knowing that everything we put on our skin quickly absorbs into our bodies, we ethically source the finest raw natural materials the earth has to offer. With ingredients ranging from French pink clay to Kukui Nut Oil to Kokum Butter, we formulate treatments that combine essential vitamins, essential oils, minerals, and botanicals to restore skin to its optimum health and vitality. What is your personal favourite from your collection and why? My personal favourite item is the Face Polish. Hands down. Plus, the scent for normal skin is to die for! I almost surprised myself with how much I loved it. It’s a combination of different botanical powders, clays and essential oils. It’s not a typical polish in that the product itself is dry. It is gentle enough to use daily, and I do. I like to follow up with our Eye Serum Duo, one for the morning and one for the evening. I feel glowing and polished. Where are Wild Poppy products available? Currently, the products are available online at wildpoppybotanicals.com and at a few local boutiques. However, as business grows so will the reach of our products. Are you planning to expand your business to Europe? Yes! Very soon I hope. As soon as I am able, products will be available to purchase and ship to Europe. Hopefully, soon after, they will be available in boutiques and general stores there as well. Instagram! Follow @wildpoppybotanicals. We are posting regularly and have many fun, new products coming soon.